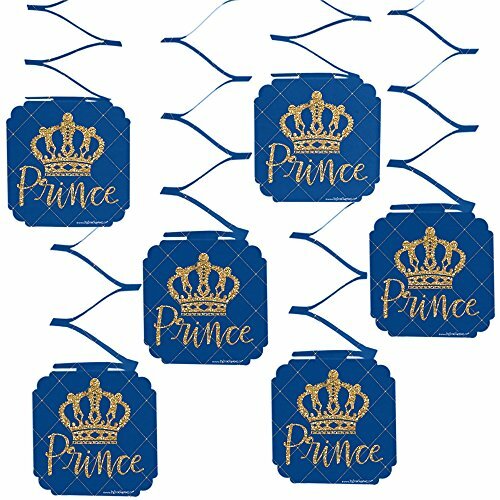 Take your party decorating skills to the next level with these adorable shaped Royal Prince Charming - Paper Straw Decor - Baby Shower or Birthday Party Striped Decorative Straws. Using the included clear stickers, simply attach the shaped paper cut outs to the straws then place it in a fun jar or bottle, or even use them as cupcake decorations. Printed on a heavy card stock paper. 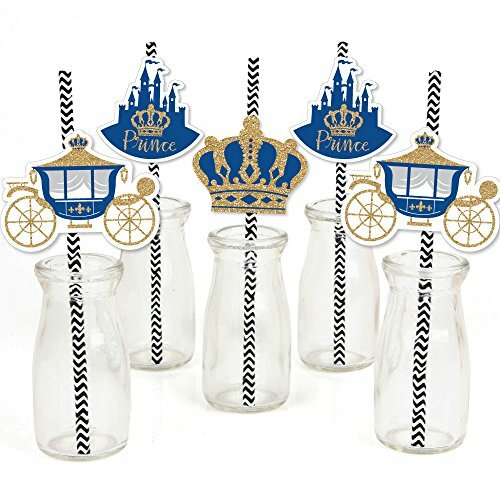 Straw Decor Set Includes: 8 castle 2.5" X 2.5", 8 crown 2.5" X 2.25", 8 carriage 3.25" x 2.55". 24 straws and paper cut-out embellishments. 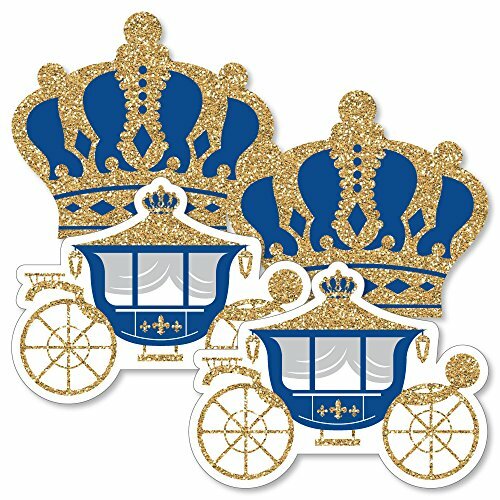 Include the display of sweet treats into your party decor by using our Royal Prince Charming - Candy Boxes Baby Shower or Birthday Party Favors! These boxes, measuring 3 inches by 2.75 inches, and sold in sets of 12, are the perfect size for your favorite bite sized candy or treat! Display several in a grouping on a candy buffet table allowing guests to sample several treats, or send each person home with their own individual treat box! Custom printed with our original artwork, these boxes are created with a heavy duty satin paper that gives the finished product a photo like shine! The perfect complement to any celebration, you'll love our themed party candy boxes! 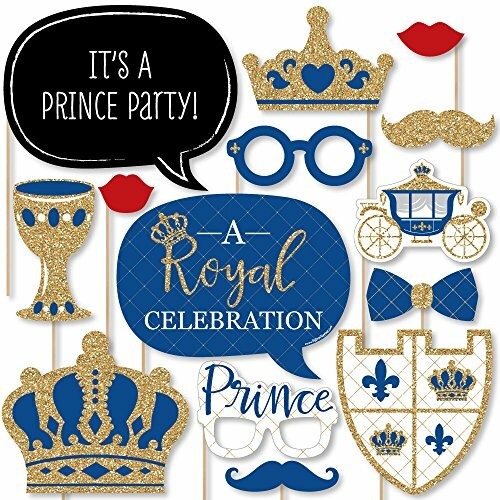 Add color and flair to party spaces of all sizes with our Royal Prince Charming - Baby Shower or Birthday Party Hanging Decorations! Each set includes 6 hanging decorations that are about 20 inches long and printed on premium-grade paper with a photo-like shine that is made in the USA. The 4.5" square base features the same bright colors and eye-catching design as our unique themes. It hangs from an accordion-folded length of paper that falls in a modern zig-zag pattern and will add a pop of fun to your next event! 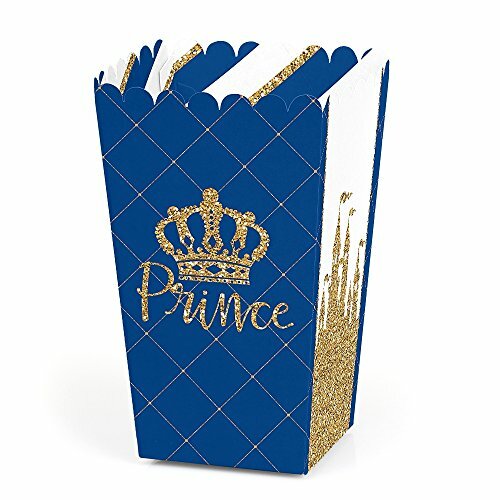 Include the display of sweet treats or with non-edible items into your party decor by using our Royal Prince Charming - Baby Shower or Birthday Party Favor Popcorn Treat Boxes! These boxes, measuring 5.75 inches tall by 3.5 inches square at the top, and sold in sets of 12, are the perfect size for your favorite bite sized candy, treat, or a favor boxes with non-edible favors! Display several in a grouping on a candy buffet table allowing guests to sample several treats, or send each person home with their own individual treat box! Custom printed with our original artwork, these boxes are created with a heavy duty satin paper that gives the finished product a photo like shine! 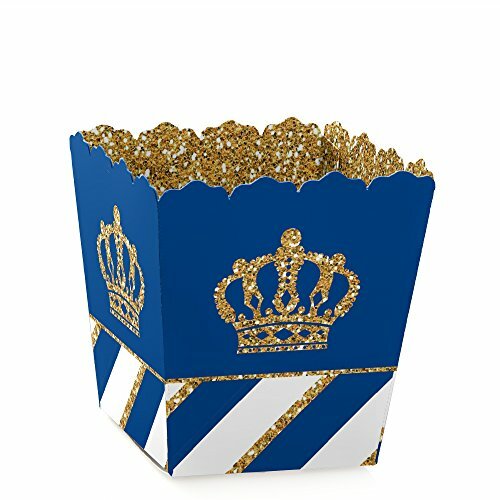 The perfect complement to any celebration, you'll love our themed party popcorn boxes! 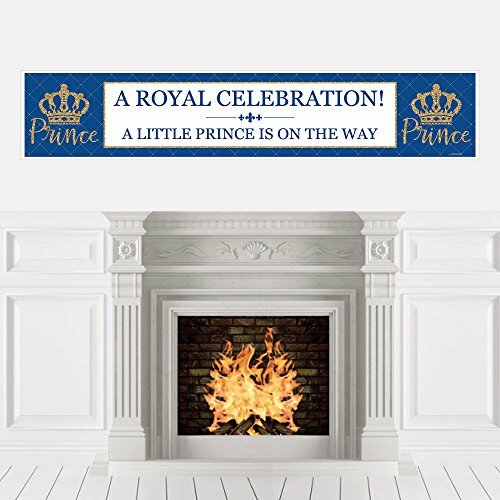 Invite friends and family to your baby shower or birthday party with a Royal Prince Charming Invitations. These fun party invites are printed on sturdy card stock paper and have plenty of space to add the party details. Plus, their unique castle shape will be adored by all your guests. Each set of 12 shaped fill-in invitations also includes 12 white envelopes, making it easy to get your party invitations into the mail. 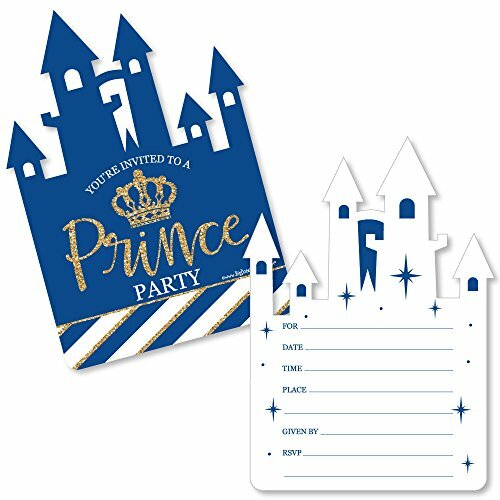 Begin planning the perfect little prince party with these party invites! 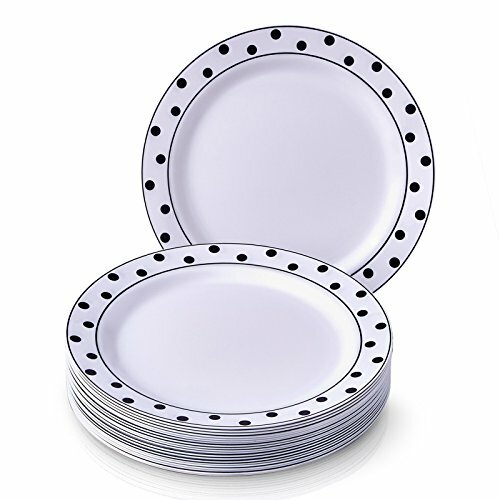 Looking for more Charming Dots similar ideas? Try to explore these searches: Black French Handbag, Mt Vernon Crystal, and Range Hood Exhaust Fans. Look at latest related video about Charming Dots. Shopwizion.com is the smartest way for online shopping: compare prices of leading online shops for best deals around the web. Don't miss TOP Charming Dots deals, updated daily.